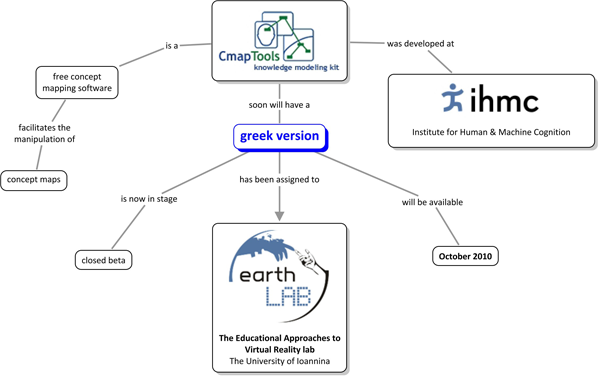 CmapTools.. now in Greek, by Earthlab! The Educational Approaches to Virtual Reality Technologies lab, on its own initiative, has undertaken voluntarily, cooperating with the Florida Institute for Human & Machine Cognition (IHMC), the Greek translation of the popular concept mapping software CmapTools. Our aim was to provide to the wider Greek educational community the oportunity to use the world's most popular concept mapping tool, contributing to the alleviation of the problem of lack of Greek mind tools. 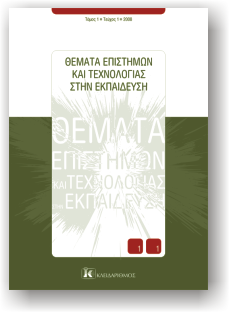 The Greek language is now available in the new version of the CmapTools (v5.04.01, October 29, 2010) for Windows, Mac, Linux and Solaris. Our immediate plans include also the translation and distribution of the CmapTools manuals.